How was your week? Do anything fun or interesting? I'd love to here about it in the comments! For me, I've had a pretty good week. For one of my classes I'm trying to write a short Hero script that I'm hoping to possibly film in the spring, but we shall see. It's a bit of a drama piece than an action one right now. I'm not sure if that good or not. 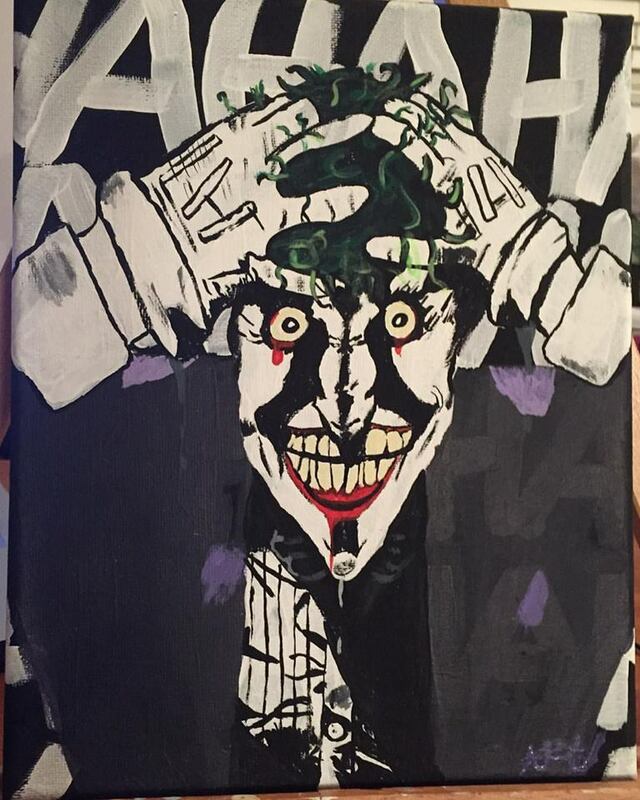 On the other hand I finally finished my Killing Joke, Joker Painting! If you check out the FlashGirl Art page here on my blog you can see all the projects I've done in the past. I have a lot of great time painting. My method to painting is pretty simple... 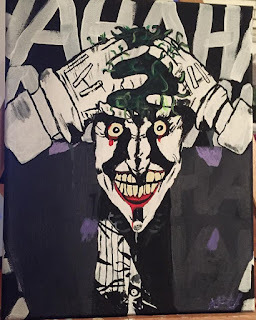 I find a picture I want to paint online, leave it up on my computer, set up my art station, and either run a playlist of songs on YouTube, or turn on a series on Netflix, and let it run on forever! I'm still a novice per say, and I'm self taught. Are the items I'm going to recommend for artistic newbies? Maybe, maybe not. Are they what the professional use? Who knows... I'm just telling you what works for me, and what I've used in the past. In the following part of this blog post, there will be Amazon Affiliation links. with a small compensation at NO extra cost to you. I starting painting again because I was the newly appointed Recruitment Chair for my Gender Inclusive Frat - Phi Sigma Pi. I was given an enormous bag filled with crafting stuff, from paints to feathers, and glue to markers. Some of it was well loved, while other things hadn't been touched at all. I decided to use what I could and add to the pack. (I also organized it, so it was easier to handle)... Anything I used too much of for personal use I replaced. It was so much fun dabbling in the crafts again! At the end of the school year when I passed the torch to the next recruitment chair, I had to give them all the crafting stuff too. The first colors I bought was Purple and Yellow because They were PSP's Official colors! a little difficult since I've have not official training. It actually turned out better than I thought! So don't be afraid to try something new! It only takes a couple of bucks and a little bit of courage!